My plan worked and I have spent a very wet Sunday morning curled up in an armchair finishing Ten-Second Staircase by Christopher Fowler. I first came across Christopher Fowler when I took his novel Darkest Day on holiday with me to Istanbul. The book (which I don’t think is in print any longer) was hugely enjoyable and introduced me to Bryant & May, two elderly detectives who are the main protagonists of the Ten-Second Staircase. I really enjoy the Bryant and May stories, and always learn something new about London, especially “all the dark and bloody history that’s being forgotten…”, and now have a list of things to Google because I want to know more! 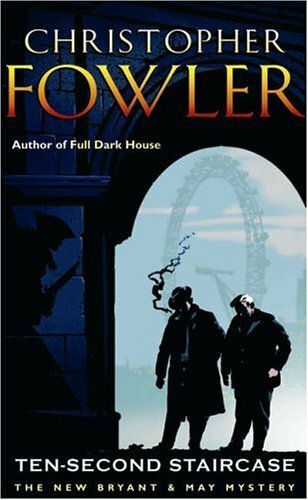 I’m not sure that this novel is the best place to start with these characters – Full Dark House is probably more accessible – but if you have read any of the others you will certainly enjoy this, especially as the case of the Leicester Square Vampire is finally resolved. BTW, Darkest Day was revised and published as Seventy-Seven Clocks; I must admit I really prefer the original…….